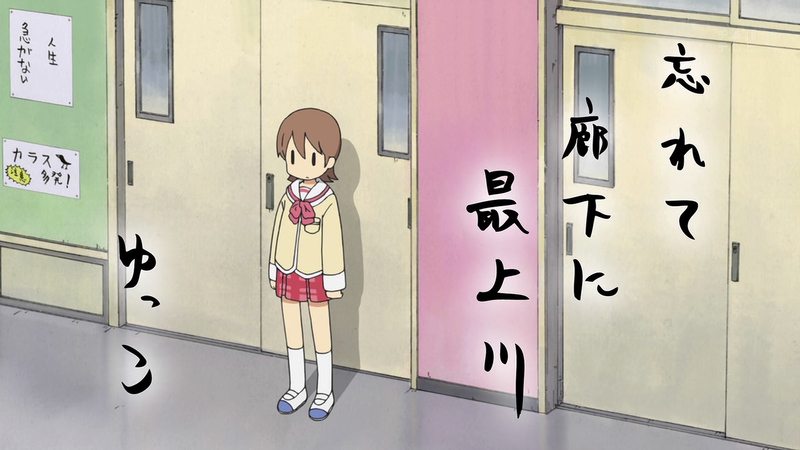 The scene described is the opening moment of Keiichi Arawi’s manga, Nichijou (My Ordinary Life). 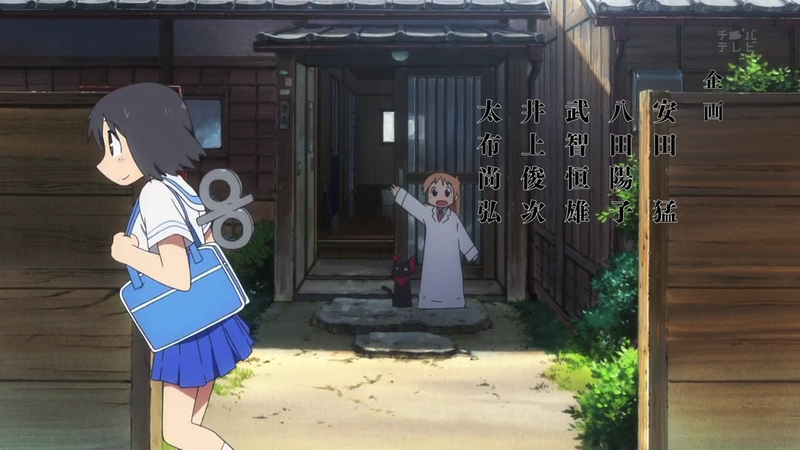 It was changed in the 2011 Kyoto Animation anime adaptation to ensure that Nano isn’t actually a proper high school student until the second half of the series. 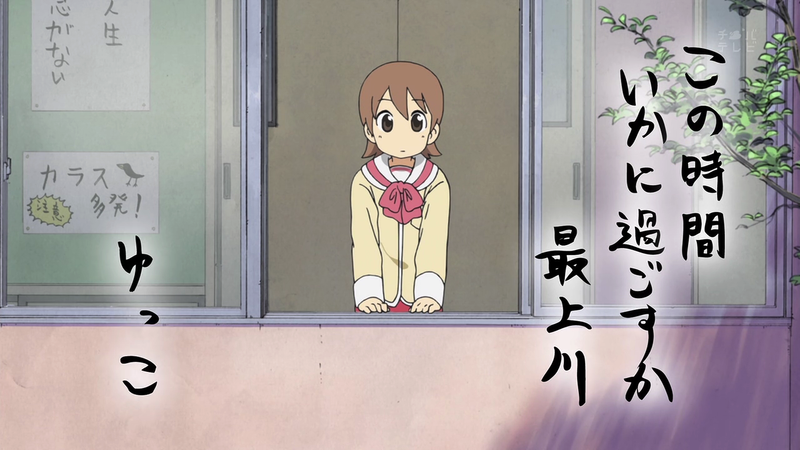 This decision to separate Nano from future classmates Mai Minakami, Mio Naganohara, and Yuuko rather than beginning the series with all of them together in class — like the manga — is an interesting one that has a significant impact on how the audience comes to know and understand Nano’s character. 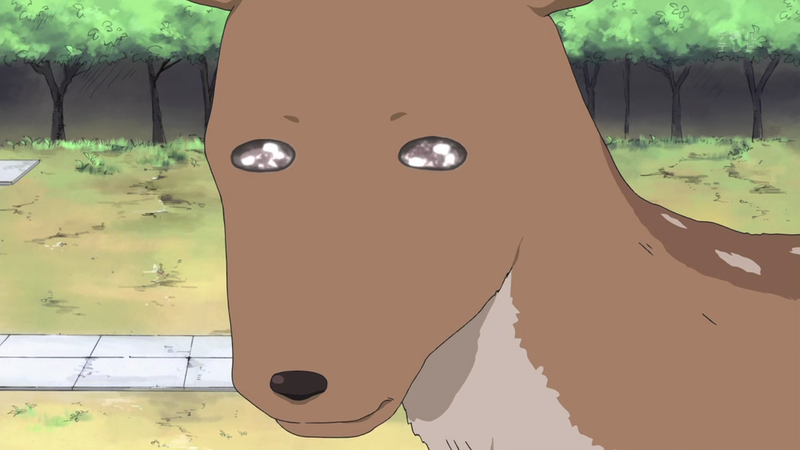 First, the obvious statement: reading manga is different than watching anime. 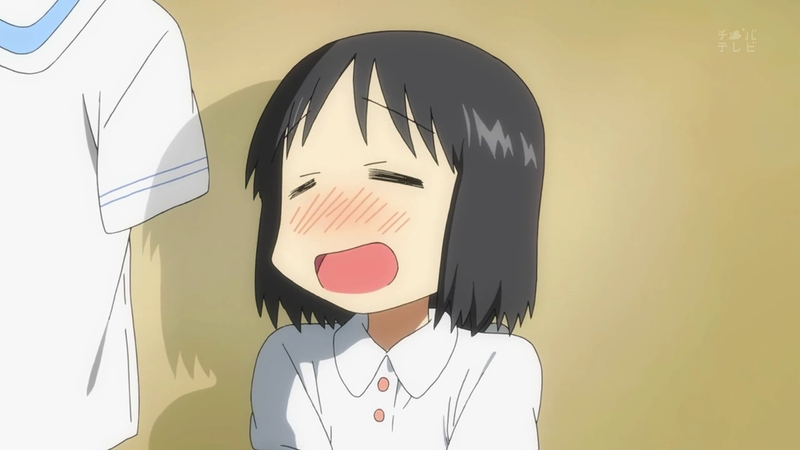 I’m a fast reader, and can burn through manga fairly easily. While reading, I choose the pace at which I consume a scene. 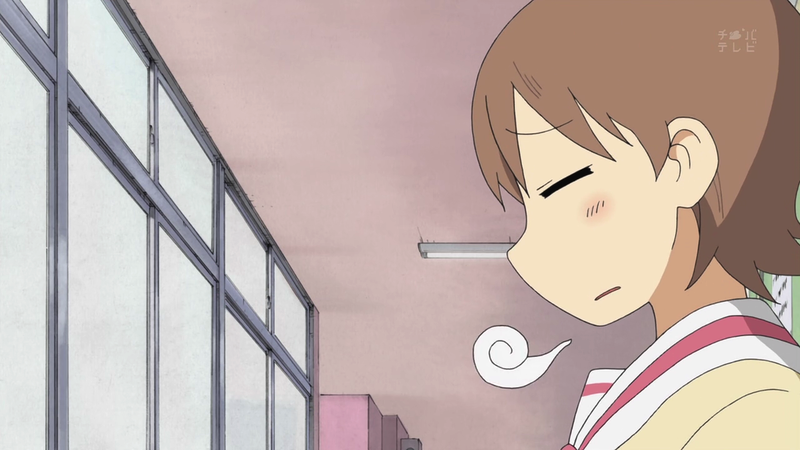 This often isn’t intentional, my mind naturally lingers on some things and sprints through others. 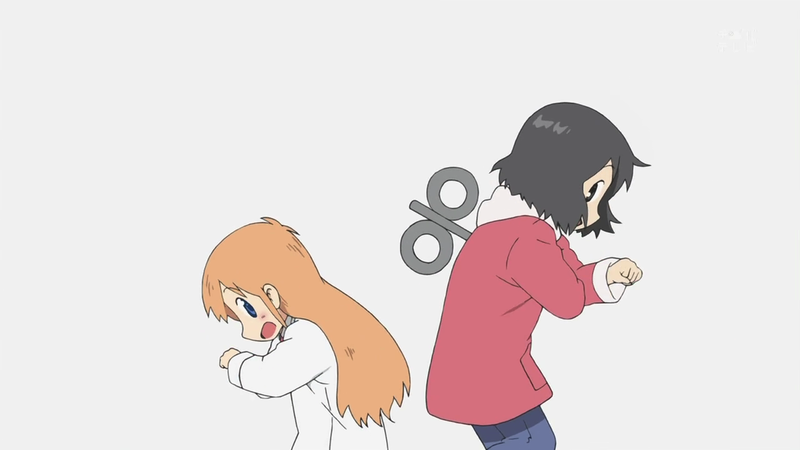 Nichijou is a comedy manga, organized into a series of vignettes that follow Mio, Mai, Yuuko, and Nano’s everyday lives. Separated into chapters — not titled 4-koma gags like a lot of other comedy manga in the same vein — the manga often leads with a few panels before introducing another chapter. It reads quickly, and even the jokes that I linger and chuckle over pass in a matter of seconds. 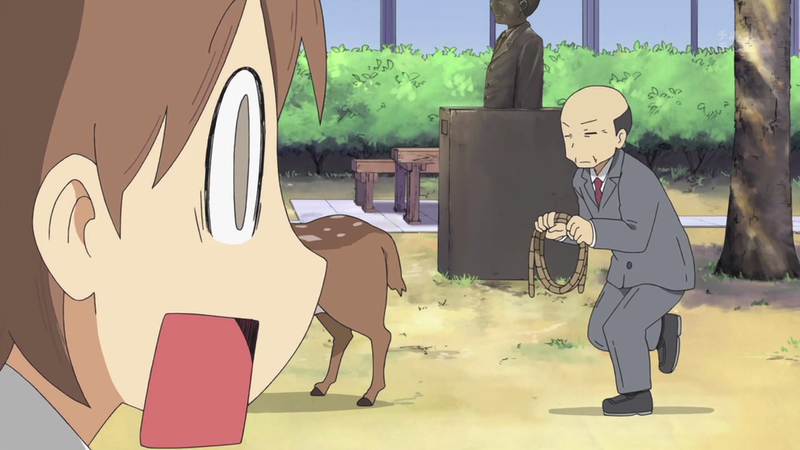 Pictured above are 14 screencaps from Nichijou Episode 6 — home of the beloved deer scene. 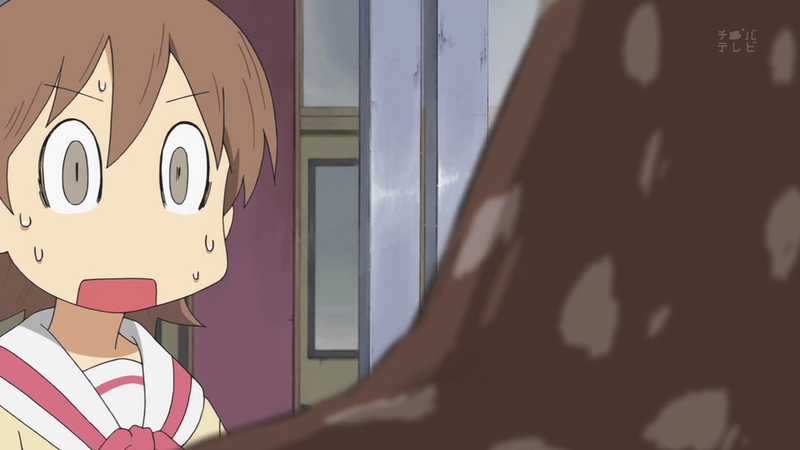 The entire gag plays off of the idea that occasionally, we happen to see something so random or unbelievable, that it’s impossible to convey to others, especially when they’re not likely to believe you. 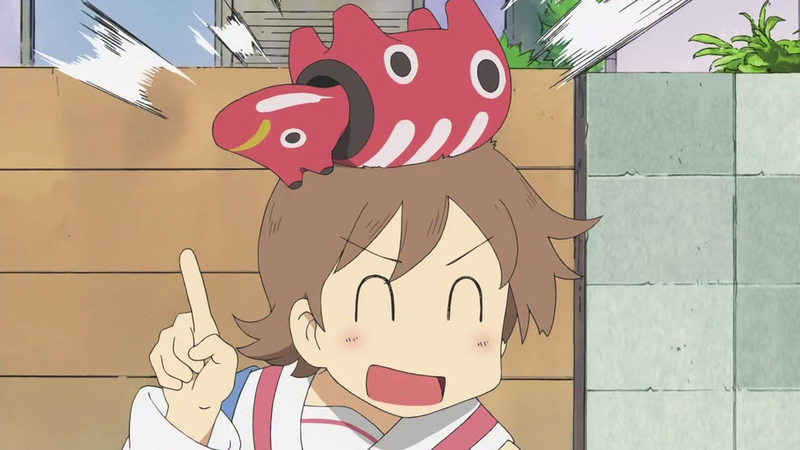 This is what happens to Yuuko. 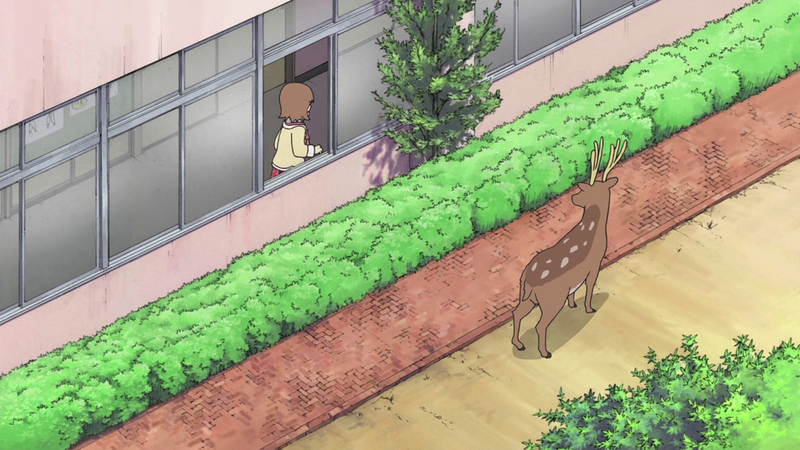 While standing out in the hallway for missing a homework assignment, she happens to witness her principal fighting a deer. 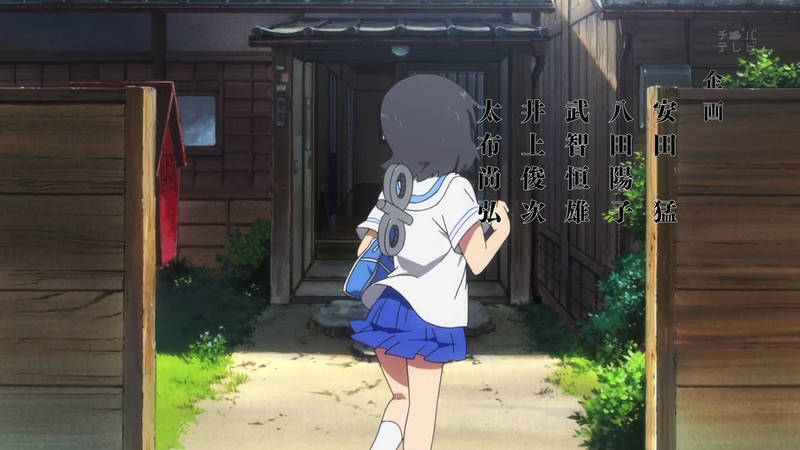 The scene takes up all of manga chapter seven — a total of six pages from start to finish, including Yuuko’s introduction where she thinks up haikus in the hallway, adding “Mogami River” as the final line like Matsuo Basho. Again, it moves quickly. 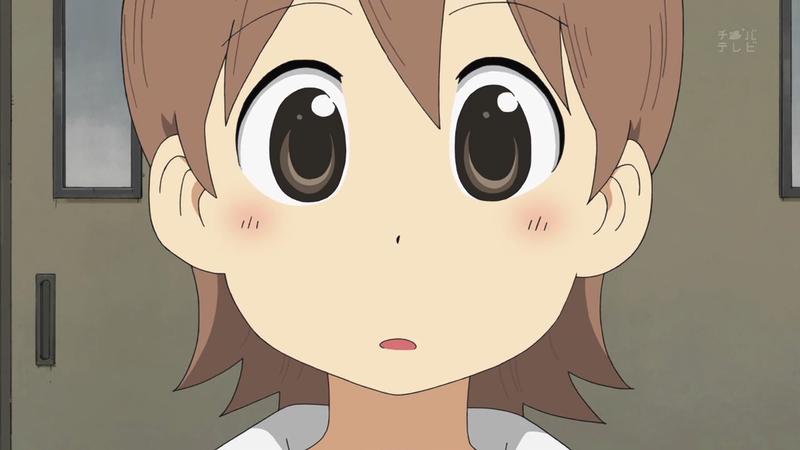 Perusing the screenshots from the anime adaptation, even giving a generous two seconds per screenshot, only takes 28 seconds. 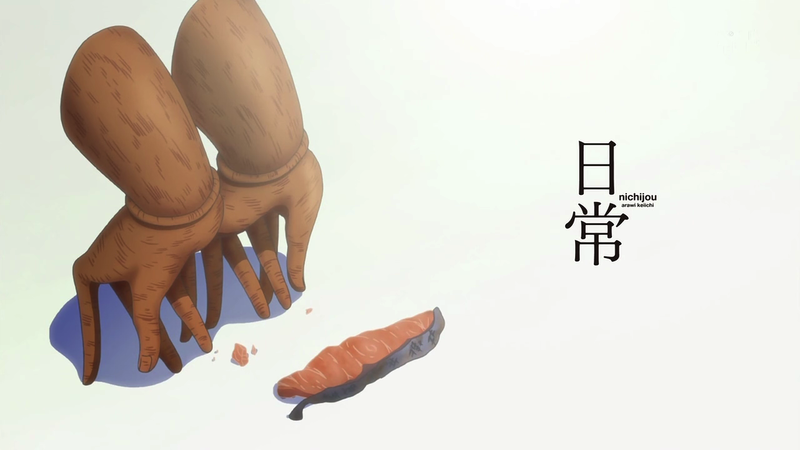 In the actual scene’s runtime, the Basho introduction alone takes a full 30 seconds. 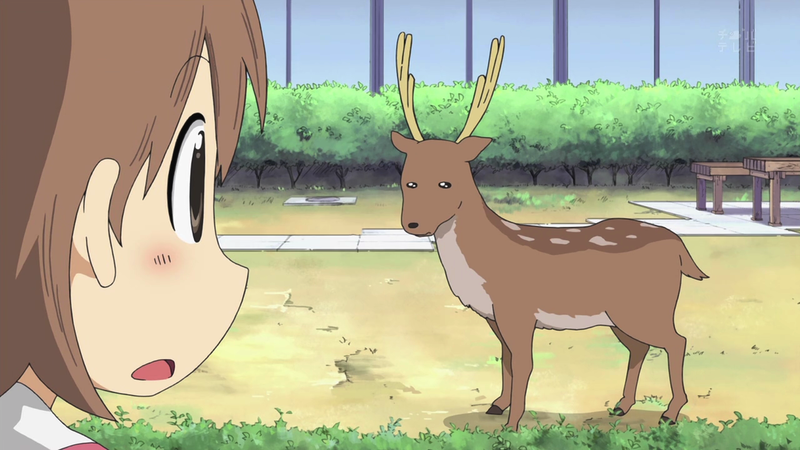 Yuuko does even see the principal until nearly a minute into the gag — the scene uses reaction shots between Yuuko and the deer, along with additional pauses and visual beats like the rustling of the wind in the trees. 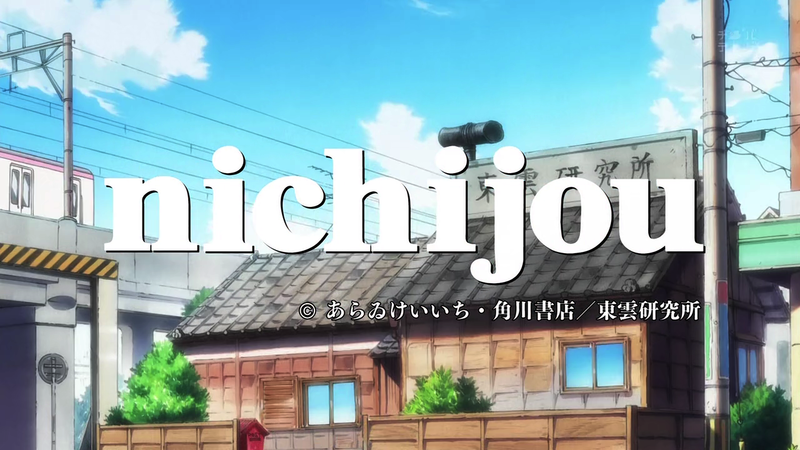 The anime is a more passive, albeit richer, experience with the camera and pacing fully in the hands of someone else. 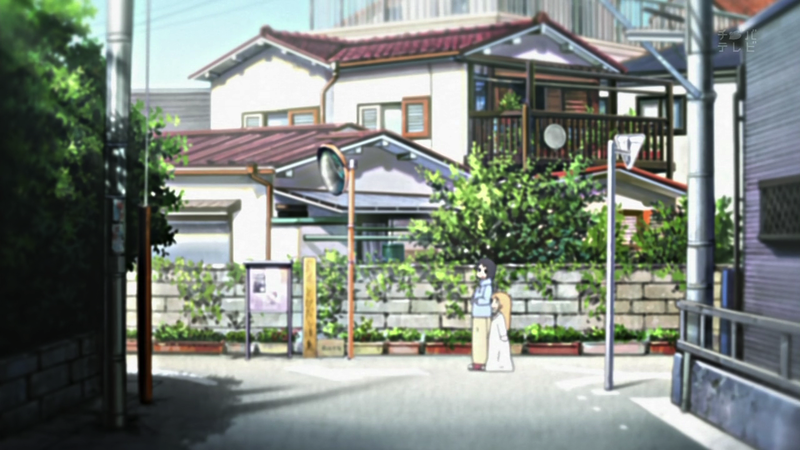 I’ve spoken at length elsewhere about Nichijou‘s use of pillow and establishing shots to break up scenes or separate different vignettes while adding an ephemeral quality to the series or marking the inevitable passage of time. 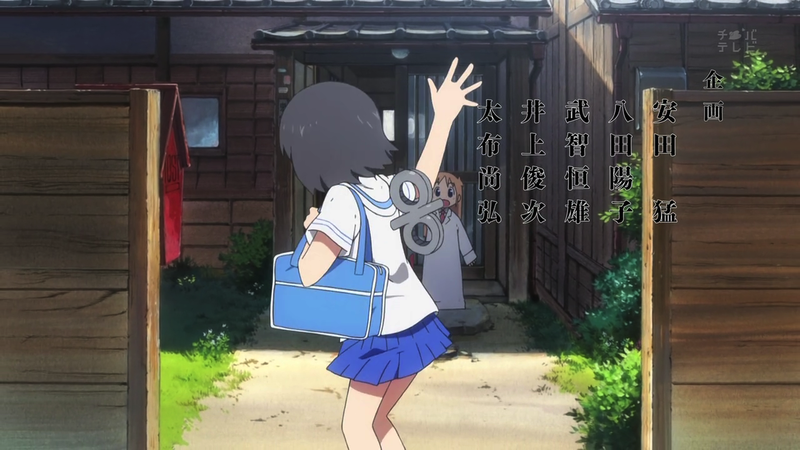 The anime also uses different eyecatches to pause the action. 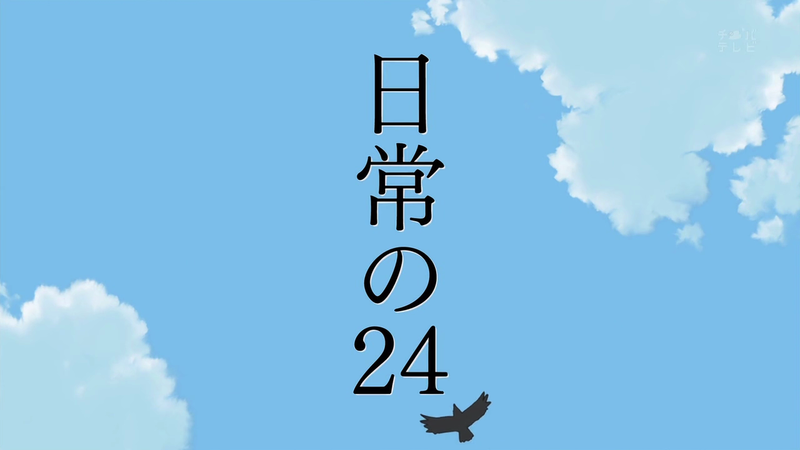 Pillow shots, establishing shots, short skits like Nano and the professor’s rock-paper-scissors bit, and eyecatches don’t always mark a clean break. They often come in the middle of the action, serving as another pause or deep breath before jumping back into the latter half of a joke. 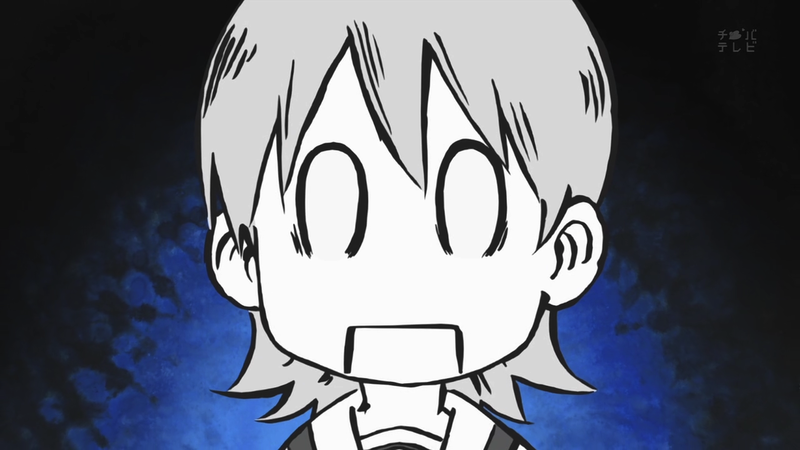 This sometimes happens in the manga, although it’s a more formulaic scene setting before the number of the chapter appears over a small punchline. Since we, the reader, are in charge of the pacing while reading, we can add pauses when we like. 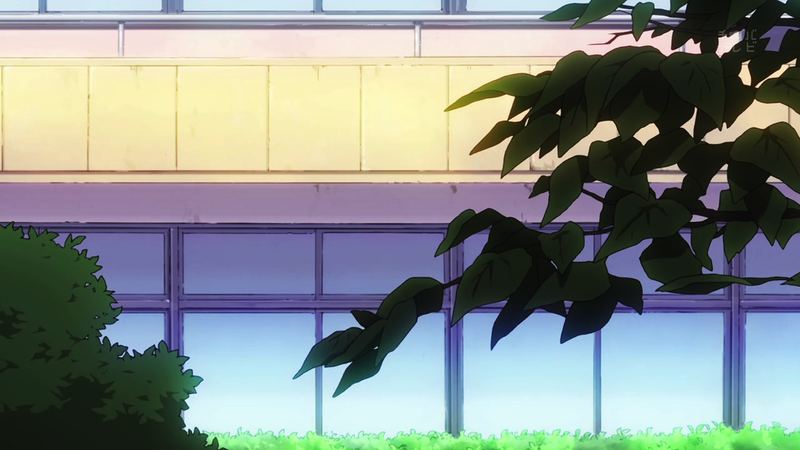 The anime does this for us, always in service of a specific emotional payoff, punchline, or point of contrast. 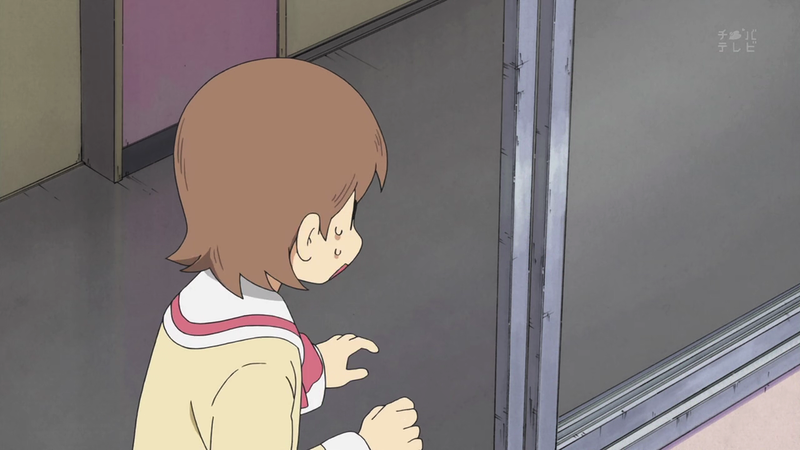 In addition to the strong animation itself, the Nichijou adaptation also rotates the camera — again, our viewpoint — itself, adding drama, humor,a different context to a specific scene. 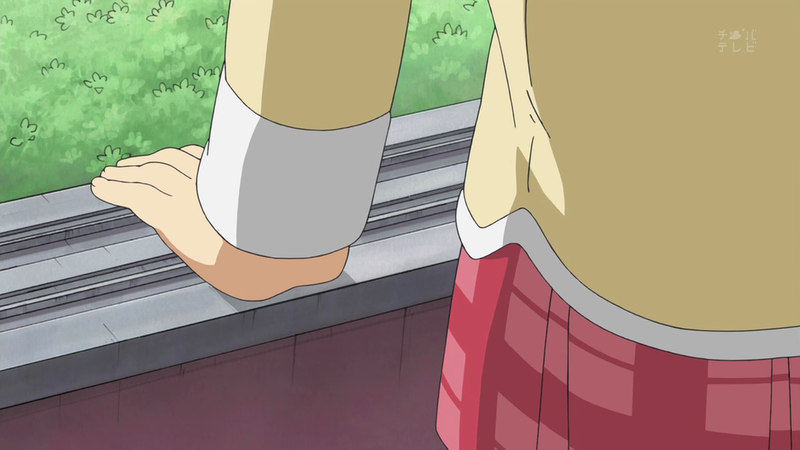 This all leads up to a neat visual trick in Episode 14. 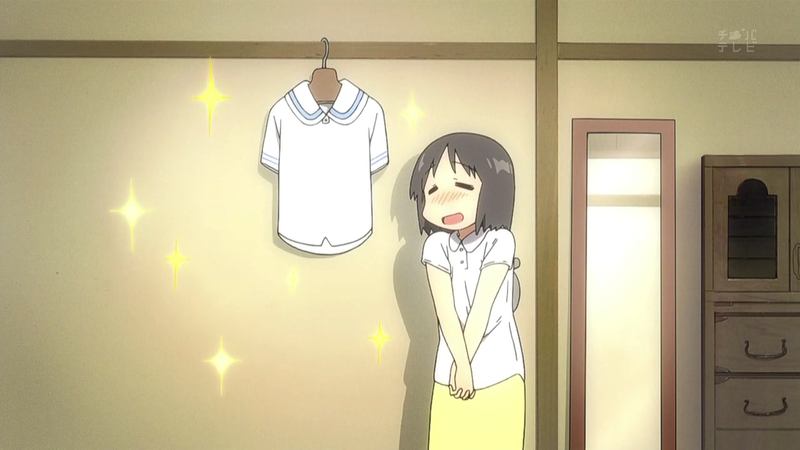 The episode opens with Nano gushing over her new school uniform and changing into it for the first time. 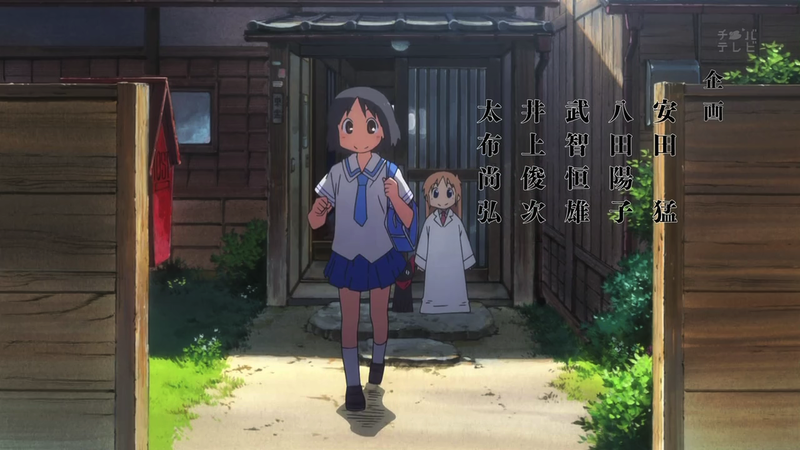 It’s also the first appearance of the series’ second opening sequence, which includes a scene at the beginning where Nano rushes off to school in her uniform, waving goodbye to the professor and the laboratory cat, Sakamoto.